For future reference the Wikitravel:CIA World Factbook 2002 import can be found at Talk:Slovenia/CIA World Factbook 2002 import. Regardless of whether bureks are Slovenian or not, the fact is that they are certainly widely available throughout the country (and I recommend the little joint in front of Ljubljana's train station). So please don't delete this... instead, feel free to add 'really' Slovene food. Cyrillic alphabet, while it was taught to "middle" generation (parts of Yugoslavia used cyrillic), is not used anywhere, so people have mainly forgot it. Russian language was not taught, and while it is also a slavic language it deviates quite a bit. Some basic words are common (across many slavic languages), but don't expect too much. So... this info doesn't seem too useful, and can be deceiving. An inside tip would be Adam Ravbar beer, which is usually hard to find anywhere except in their small brewery (located in Domžale, a town about 10 km north of Ljubljana). Is this allowed here? I mean... it's not some very popular beer. Never heard of it until now. OTOH, one can find smaller breweries here and there. "Slovenians also (like many Europeans) don't like American foreign policy, their way of living or habits, so be careful when you discuss European-American relations. Most people lived a good life during the socialist era, so try not talk badly about Cuba, Venezuela or Russia, since Slovenians tend to be pretty sensitive to this subject." re: I think slovenians are very reserved / sensitive and won't talk about more 'socialist' systems in those countries. But if you force us to then discussion can be very heated as we are still very divided into those in favour of partisans who often liked old socialist system and the other half that viewed it as a brutal regime. It all goes to partisans and domobrans and both view each other as traitors/collaborators. The southwestern corner of Slovenia with rolling hills, awe-inspiring caves and the country's 42 km of coastline. The mountainous northwest with hiking, rafting, postcard pretty lakes and Mt Triglav, the symbolic heart of Slovenia. The capital Ljubljana and surround region. The region around the Krka and lower Sava Rivers. Mountains in the north and the Savinja river valley. 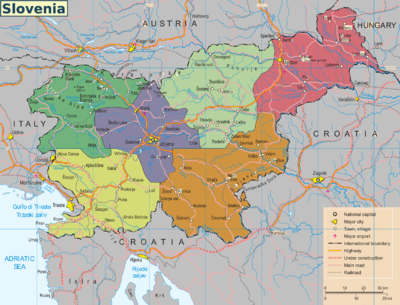 The region around the Drava and Mura Rivers, with plenty of vineyards and a Hungarian influence in the east. As in other countries of ex Yugoslavia, in Slovenia there is still sexual segregation. Women are paid miserably less for same work than men. Slovenian men mostly act like gentlemens, but also sublime towards women at the same time. Women shouldn't express their feministic opinion too much, since Slovenian women like their position (nevertheless, they're being spoiled) and men don't want to give too much power to women. Information that Slovenian parliament has the less female senators in whole Europe in strong enough. I removed the prose about difference in "openness" in eastern and western regions and other thoughts on cultural diversity between Ljubljana and Maribor (including a photo of Maribor hooligans), and warnings about not getting into discussions about Ljubljana and Maribor. All of this is completely subjective (I live in Ljubljana and don't sense any of these) and certainly irrelevant for travelers. I removed the paragraph about giving sits to elderly on the buses as this hardly specific for Slovenia. I merged the paragraphs about discussing Soviet bloc, communism, Eastern Europe into a single shorter paragraph about "interesting" topics. I merged the paragraphs about border issues with Croatia and the Slovenian civil war into a single paragraph on taboo topics. I simplified the paragraph on LBGT. The original text was also rather unclear; I believe that the current version gives an objective description, although I'm not an expert. I removed the paragraph on racism since there is nothing specific about Slovenia here; as elsewhere in Europe, city people are used to seeing tourists of all kinds, while in villages any foreigner would get curious looks. In practical advices, I removed the one about using formal form (vikanje, as "Sie" instead of "du" in German or "vous" instead of "tu" in French). Anybody who can speak Slovenian, knows about it, others will just get confused. In general, I didn't add much, the intention was to make the existing text more focused and less wordy. It has been asked if someone could add information on horse meat in Slovenian cuisine...In regards to Slovenes eating horse, yes it is true that some people do eat it. But, this is not that typical. It has been a tradition here in Slovenia for many hundreds of years, but of course with the passage of time and worldly influence, has become somewhat taboo like anywhere else in the western world. The taste of horse tenderloin is quite delicious and the Sokol Restaurant in Ljubljana serves it, called "Foal Fillet". They also have their own home-made beer which is quite nice. If you're looking for traditional Slovenian/Germanic style old world cooking, Sokol will not disappoint. Just outside of Ljubljana, in BTC Center (The shopping area) is a butcher's shop / restaurant called Mesarstvo-Krusic. Their website is http://www.mesarstvo-krusic.si/. I have been told it's one of the best places for horse meat and most people I have spoken to about it rate it it quite highly. Last but not least there are a few places in Ljubljana to buy the famous horse burger. The most famous one started out as just a small stand in Tivoli Park, roughly the size of an ice-fishing shanty, and has grown a bit larger. The stand, simply called "Horse Burger" can be found near the stadium and if you ask anybody "Where is the horseburger man?" you will be guaranteed to be shown. This page was last edited on 30 November 2012, at 15:31.